One of the ironies I constantly contemplate is my choice of study and my identity as a Black woman. Notable characteristics of my appearance, like my robust stature and dark-brown skin, make my Black womanness even more pronounced. I am also a doctoral student studying the history of education in the US. I investigate the past, and some might argue present, exclusionary practices of educational institutions—practices that are most certainly found in the academy itself. Just decades ago, few Black women had access to PhD pathways, much less faculty positions, especially at competitive research universities like the ones I have attended. So, in a sense, I knew what I was getting into. I entered well-aware of the institutional, systemic norms that have precluded Black women from doing this work and creating knowledge that seeks to disrupt many of the corrupt, perverse, misguided myths about who we are and what we have done. My awareness, though, has not made my short journey less arduous. 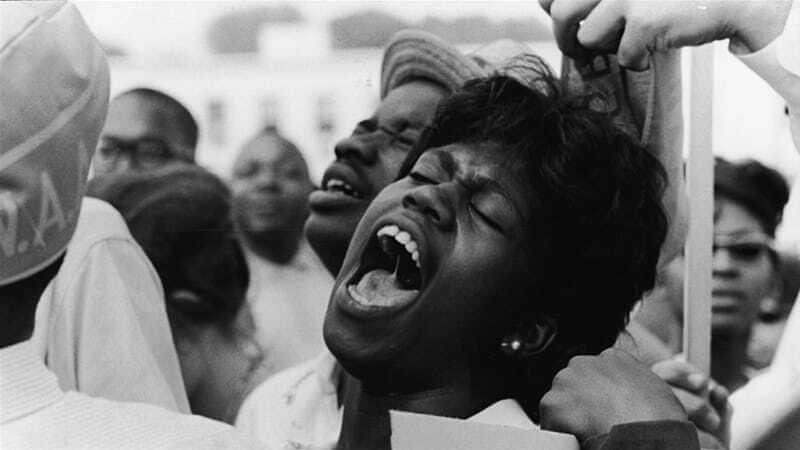 March on Washington, 1963. Courtesy of Al Jazeera. I could attempt to separate key markers of my visible identity. However, I have not found this to be productive in any situation, in or outside academia. Taken together, the intersection of my race, gender, skin tone, and stature determine how others perceive who I am and my abilities. Admittedly, my identity as a cis-hetero, Christian woman from a working-class background, as opposed to a lower socio-economic class, has indeed worked in my favor. Yet, daily, I am met with denigrating presumptions that falsely indicate how unfit I am for my career choice, evidenced in the microaggressive surprise that spreads across white folks’ faces upon disclosing that I am a PhD student. My entire physical appearance invites such responses. My racial identity suggests that high level thought and academic rigor are beyond my reach. My gender identity presupposes I am too emotionally unstable and unreliable to generate scholarly research projects or meaningfully contribute to my discipline. My robust stature draws unwelcome, uninformed assumptions about how well I care for and about my body and, thus, advances unfounded ideas about my capacity to produce quality work. And my skin tone casts me as menacing, dishonest, sneaky, and unattractive. Though perhaps individually contested, these parts of myself never stand alone; I embody them, and they outline how my work and I are interpreted. In academia, these identity markers prescribe how I must navigate this terrain. As a Black woman studying the historical significance of race, gender, and class, I enter academic spaces knowing I am assumed to be inferior and incapable by those who feel they are deserving. These are the same individuals who undermine my scholarly worth because of my identity and positionality. But I did not enter the academy for or because of them; I am here in spite of them. I am rightfully here for other peculiar Black girls who have yet to generate knowledge that folks in power use to decide their destiny. And this is precisely what I must remember. Daily, I am met with denigrating presumptions that falsely indicate how unfit I am for my career choice, evidenced in the microaggressive surprise that spreads across white folks’ faces upon disclosing that I am a PhD student. For example, across a diverse range of universities and other academic spaces, I have noticed a trend in numerous course syllabi and texts therein that aim to explore topics about Black people and their experiences. Strangely, few of these works are authored by Black scholars themselves. This is striking for a number of reasons, one of which I will discuss later. But, if and when I raise this point in conversation, I am met with opposition from multiple angles and asked to extensively justify my observations. Challenges to my assertions range from denial to ire, and they are typically laced with condescension, racism, sexism; these rebuffs culminate in remarks about my inability to give authors the benefit of the doubt and take the text for what it is. My commentary is misconstrued as an accusation against authors’ intentions, rather than an indictment of authorial misperception and the centering of white cis-hetero maleness, as I intended. My contestations frequently fall on selectively deaf ears. Relatedly, the academy’s obsession with objectivity continues to strike me as paradoxical. As I seek to grow my knowledge and understanding of Black people historically, many, dare I say most, of the resources I must consult have been created by white, male academics. The academy touts these academics’ distance from their subjects and subject matter (i.e., their objectivity) as an integral component of their work’s excellence. And should contributions by scholars of Color, or Black women scholars more specifically, happen to appear on syllabi or come up in conversation, their work obliges a degree of investigative skepticism unexpected when assessing white male scholars’ work. The academy reads an emotional tinge, often coded as passion or conviction, into works by many Black women that minimizes their scholarship’s value and relegates it behind what the academy deems objective. Apparently, objectivity occurs as a form of white privilege. In response, I have taken to theories and epistemologies that hold experiential knowledge in high regard, like Critical Race Theory and Black Feminism. However, this is not a complete remedy, for being preemptively aware does not make the journey less trying. Even in settings where the power structure is inverted and I represent authority, my position and expertise are challenged. Teaching largely white, middle to upper class undergraduates, I have confronted immense pushback against the possibility that inequity exists, meritocracy does not, and colorblind perception is perilous. My mention of potential limitations within western epistemologies, which govern the academy, speaks back to the miseducation I strive to debunk. I, like many Black women academics, must remain hyper-conscious of my comportment and the interaction norms I must follow: from how I dress, to how I speak, to the caliber of my assignments, to my email etiquette. For me, it is easy to fall into the angry Black woman trope, so I must perform the additional labor of policing my demeanor, facial expressions, and tone just to be granted a fairer shot because, in addition to my Black womanness, my robust stature and dark brown skin tone make it harder for my work to be impartially evaluated. This is especially true at conferences or other areas where my identity is decontextualized and viewed plainly for what it is. The psychological stress I have to negotiate can make the smallest tasks overwhelming, such as sending emails or requesting meetings with faculty members or administrators. Despite these adversities, highly accomplished, radical Black women professors continue to show me that there are ways to do this work and remain spiritually, intellectually, and physically intact. That said, the motivating factor compelling me, along with many of my professional comrades, to pursue this career is the far too frequent demonstration of oppression, racial, gender-racial, class, or otherwise. One of the greatest burdens I bear is the pressing obligation to repair social ills through academic work. Clearly, this is a tall feat, particularly for a first-generation college student with little hegemonic social, cultural, or financial capital to draw on. I aim to expand the bounds of what the academy is and does, to develop into a scholar-activist who refuses confinement in an ivory tower, which disconnects me from the communities that motivated me to pursue this career. Even in settings where the power structure is inverted and I represent authority, my position and expertise are challenged. Teaching largely white, middle to upper class undergraduates, I have confronted immense pushback against the possibility that inequity exists, meritocracy does not, and colorblind perception is perilous. In spite of the substantive hardships, I welcome the opportunity to participate in knowledge production and engage in conversations about my loved ones and me, conversations that have historically prohibited us from participation in that knowledge production. I see the academy as a place where I can, to some extent, fight back. In other words, I relish the chance to speak directly back to my oppressor. I feel well suited to such a task, as the academy’s demands align with my skillset. Though daunting, I enjoy academic reading, the writing process, and communing over ideas. Given that few professions or careers provide full shelter from oppression and disfranchisement, I have settled on the one in which I feel I can optimize my talents in the collective struggle for justice. I get to pursue research interests that allow me to write refutations of the ways systems of power operate to further repress underserved groups. This is empowering and motivating, as I hope one day that scholars aspiring to supplant injustice with justice will have my work at their disposal. Dream Series No. 5: The Library, by Jacob Lawrence. Courtesy of PAFA.org. Part of this journey is my working to reorient how I see the part I play in fostering justice. I am one small part of a tremendous, sophisticated system that feeds off white supremacy, anti-Blackness, and sexism. Doing this work allows me to cultivate a nuanced understanding of the repressive forces surrounding me, calling them out. This work is laborious, yet immensely rewarding. I am also coming to see that scholarship is not solely responsible for the racial, religious, sexual, ability, gender, or class inequities that persists across society, which means it cannot be the sole remedy. Such a panacea does not exist. Though scholarship informs policies and regulations, and helps society understand past and present facets of life, there are multiple factors that affect how scholarly information travels and where it reaches. In light of all of this, I am coming to understand that to be most impactful my role must be tailored specifically to my skillset. It must join others’ actions and contributions to generate sustainable solutions that create better conditions for a better world. I have stopped feeling that I must have all the answers right now. I am learning to accept that oppression is far more complicated than any single solution, and I must be committed to understanding its intricacies as fully as possible before I can offer anything useful. In other words, I am focusing on being the best student possible and channeling my fury into good, bad, and mediocre analyses that have attempted to frame and examine some of the same issues I want to understand, mitigate, and eventually overturn. I am one small part of a tremendous, sophisticated system that feeds off white supremacy, anti-Blackness, and sexism. Doing this work allows me to cultivate a nuanced understanding of the repressive forces surrounding me, calling them out. As a historian of education in training, I am entering a legacy of scholars, mainly white, mainly male, mainly cis-hetero, mainly middle to upper class, who have documented pressing issues from similar perspectives. My job now is to revisit these ideas and attend to what they might have omitted or overlooked. I have had to expand my imagining practices to envision a just world, holding on to the possibility that it can come into fruition. While I may not see it materialize, doing this work as a Black woman in the academy demonstrates my hopefulness that it is possible. My hope is at times complicated by indignation, frustration, and disgust, but it inspires me to continue foraging in search of equity, justice, and freedom. Right now, I am working to be okay with learning and understanding issues in their fullness and complexity. Along with this, I am also pushing myself to abide by my own ethical, moral, and political guidelines, which shape how I respond to injustice and how I model justice in my own life. Checking all dimensions of how I live, such as my consumption practices, financial decisions, and refusal to deny anyone their full humanity, pushes me to align my politics with my behavior. Drawing firm boundaries that guide what I will and will not do is helpful. For example, I refuse to alter my physical appearance by lightening my skin or chemically straightening my hair to secure job opportunities. I will not be deceptive or dishonest, especially in ways that harm or disadvantage others in order to advance my career. These are important steps I cannot forsake because it is from this place that my burgeoning scholarship and scholarly identity will meaningfully develop. 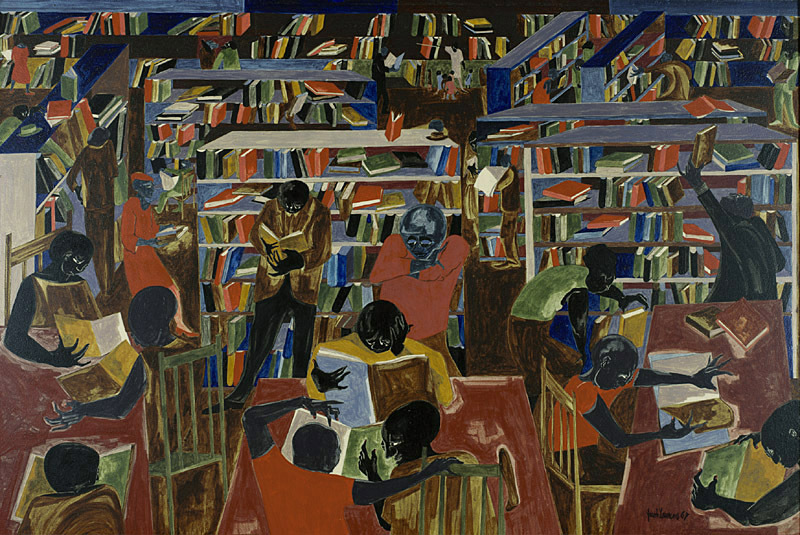 The Library, by Jacob Lawrence. Courtesy of AmericanArt.SI.edu. Doing this work as a Black woman impels me to disrupt baseless assumptions about what my capabilities are while I figure out how to be a scholar and part of the academy. I have to do this work so subsequent Black women have less oppression to sift through in the future. My hope is that they can concentrate more on their scholarship and less on the politics of being part of a historically marginalized, underserved group. Some of the coping strategies I have learned include joining a community of radical Black women scholars, who are committed to the eradication of oppression. The short time I have spent in the academy, rather in its margins as a Black woman PhD student, has come with its share of tests and trials, which I anticipate will only grow in complexity and difficulty. Communing in this way reminds me that I do not have to work alone and that there are, in fact, genuinely safe spaces wherein contesting and being contested can be a fruitful enterprise of affirmation, growth, resistance, and strength. These experiences have helped me see that radical Black women bring a vital perspective to the academy, a perspective that it is in urgent need of. ArCasia James is a doctoral student in Education Policy, Organization, and Leadership department where she studies the history of education at the University of Illinois at Urbana-Champaign. She hails from Texas and graduated with her BA from the University of Texas at Austin. Before earning her MSEd from the University of Pennsylvania, she taught social studies and literature domestically and aboard. Her research foci include oral history, Black educational history, Black feminist theory, and Critical Race Theory. She is preparing for qualifying exams and a dissertation project that examines the gendered dimensions of mid-twentieth century school desegregation. She can be contacted here. Just to put some of this into perspective… I am a White, blond, blue eyed, cis-male, and as a grad student encountered constant rejection, humiliation, condescension, insult, and challenges like those you document. Obviously, however, I cannot assume it is all racism or sexism. Rather, it is daily life in academia. It was a daily humbling ritual. Egos are enormous in that petty arena. Rivalries and jealousies are constant. Yes, people often gave a (micro-aggressive?) expression when I said that I am a PhD student. (They’re thinking ‘why the hell are you doing that!’). Students constantly argued and challenged my legitimacy and authority. Professors, including my advisers, were frequently condescending and outright insulting. All of this is quite normal. To take it personally or assume that all of these things are racism, is simply delusional, self-pitying, and narcissistic. To read ‘racism’ behind every expression or rejection or criticism is simply a paranoid, unhealthy outlook that will make you miserable in the end. Academics often have a naive, pompous sense of self-importance about their work and research (more narcissism). But pretentious academic writing is not nearly as important as they think… The best way you can help to uplift Black women, including yourself, would be to leave academia, start a business, and employ some Black women. There are no safe spaces in academia, for anyone.